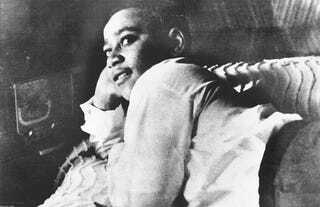 The investigation into the 1955 murder of Emmett Till may once again be reopened by the U.S. Department of Justice, with the news coming just a week after Attorney General Jeff Sessions expressed his support for pursuing and prosecuting those involved in the killing who went unpunished. “He said no one gets a pass,” Emmett’s cousin Deborah Watts, who met with the attorney general, said. Jeff Sessions Met With Emmett Till’s Family, but Will He Give Emmett Justice? According to the Clarion-Ledger, officials in the DOJ are looking into reopening the case once again because Carolyn Bryant Donham openly admitted to lying when she testified that the 14-year-old Chicago native touched her. She repeated the lie to the FBI a decade ago. Donham was thrust back into the national conversation after a story broke about her admitting to a lie that cost a teenage boy his life. The 82-year-old confessed about 10 years ago to author Timothy Tyson, a Duke University senior research scholar, who was working on the book The Blood of Emmett Till. Of course, by “what happened,” she means the fact that Emmett was kidnapped from the Mississippi home of relatives by Donham’s then-husband, Roy Bryant, and his half-brother, J.W. Milam. The young teen was beaten, mutilated and shot to death before the duo sank his body in a local river using a 75-pound gin fan tied around his neck. An all-white, all-male jury acquitted Milam and Bryant in Emmett’s murder. Months later, the two men admitted, in a magazine spread, that they had indeed killed the teen. “The Department is currently assessing whether the newly revealed statement could warrant additional investigation,” acting Assistant Attorney General T.E. Wheeler II wrote to U.S. Rep. Bennie Thompson (D-Miss.) in a letter about Donham’s confession. He also advised people not to raise their expectations. This will not be the first time that the case has come under scrutiny since the trial. In 2004 the FBI reopened the case and had an agent speak to Donham, who has been divorced from Bryant since 1975 and later remarried. Lying to the FBI, a federal crime, has a five-year statute of limitations, the news site notes. In 2007 a majority-black grand jury in Greenwood, Miss., declined to indict Donham after considering charges from aiding and abetting murder to accessory after the fact, and the FBI closed the case. Of course, Donham has written a book about all her experiences in the case, because why not add monetary gain to insult and injury? The unpublished memoir, More Than a Wolf Whistle: The Memoir of Carolyn Bryant Donham, won’t be available to the public until 2036 or until she dies, but law enforcement can subpoena her words.